In the great spirit, I give you meatballs. Standard holiday fare? Maybe not, but they make me feel cozy and happy, so they get a special spot on the holiday menus. The original recipe from Ottolenghi calls for you to bake the balls in the sauce for 5-10 minutes at the end, until browned and thickened. I found this to be lovely, but it does make the sauce very, very thick and a bit chunky. Using the tahini as a sauce post-baking gives you a less solid, more malleable product that has all the same great flavor. 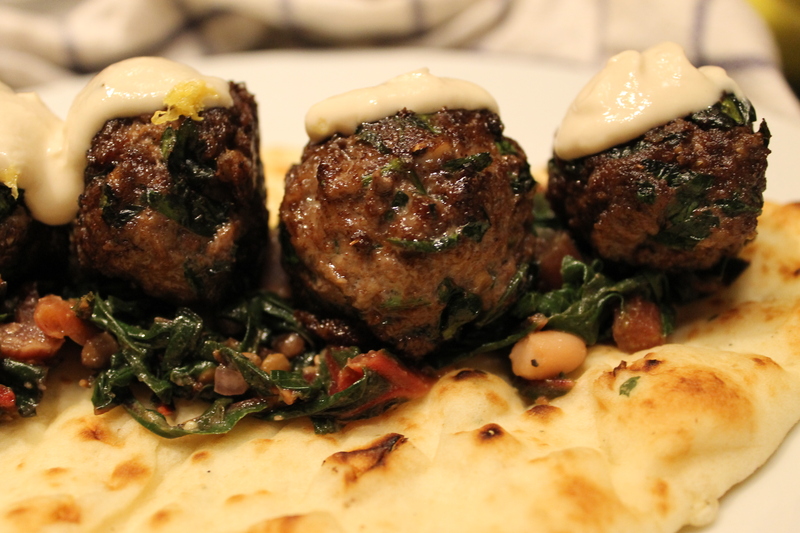 We had them on a bed of sautéed chard that had been tossed with a shallot vinaigrette, lentils, and white beans, and folded into a warm pita. It was divine. 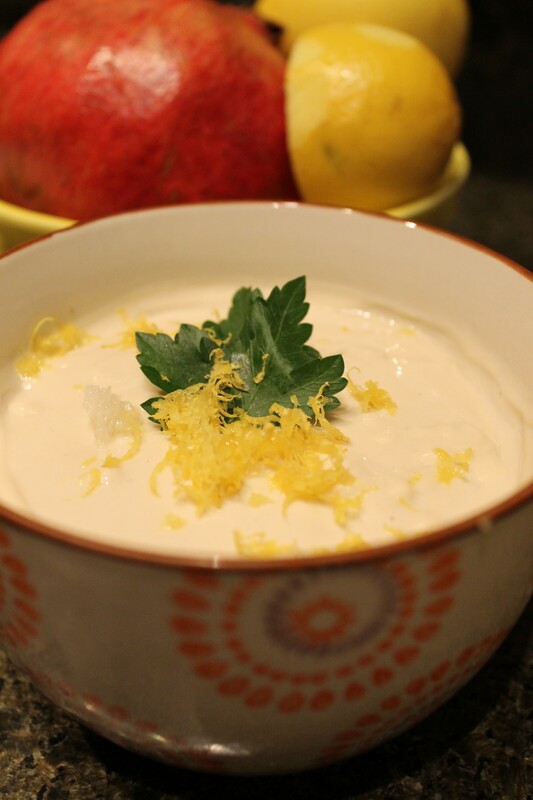 Mix all ingredients for tahini sauce in a small bowl until smooth and set aside. If too thick, add a touch of water. Soak the bread in cold water until very soft. Squeeze out as much water as you can and crumble into mixing bowl. 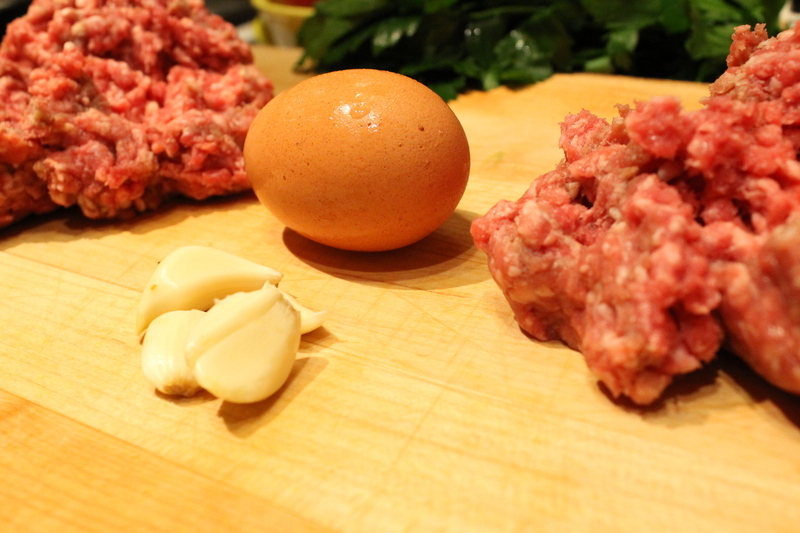 Add garlic, parsley, salt, spices, and egg, and mix well. Crumble in meats and mix with your hands until just incorporated. Do not overmix! Shape into balls the size of golf balls. Heat olive oil (about ¼ way up side of a medium cast-iron pan) over medium high. 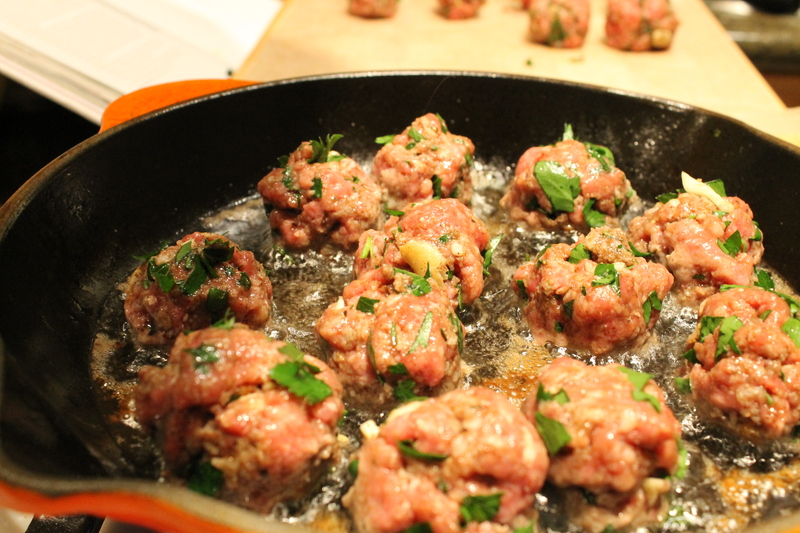 Fry meatballs in batches until brown, about 2-3 minutes per side. Transfer to paper towels when done. Arrange in single layer on oven proof dish. Bake for 10-15 minutes, or until cooked through. 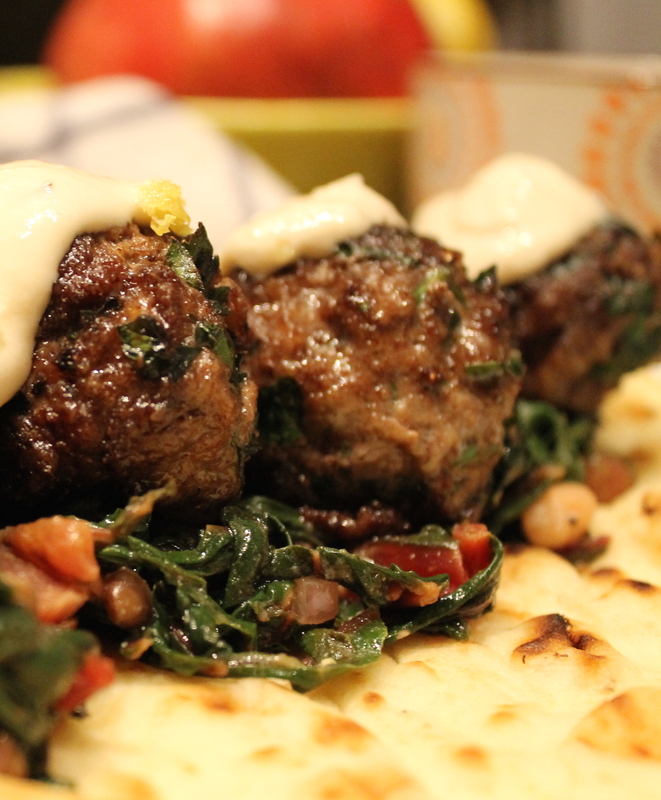 If baking with the tahini sauce, take out after 5 minutes, pour evenly over meatballs, and return for 10 minutes or until brown. 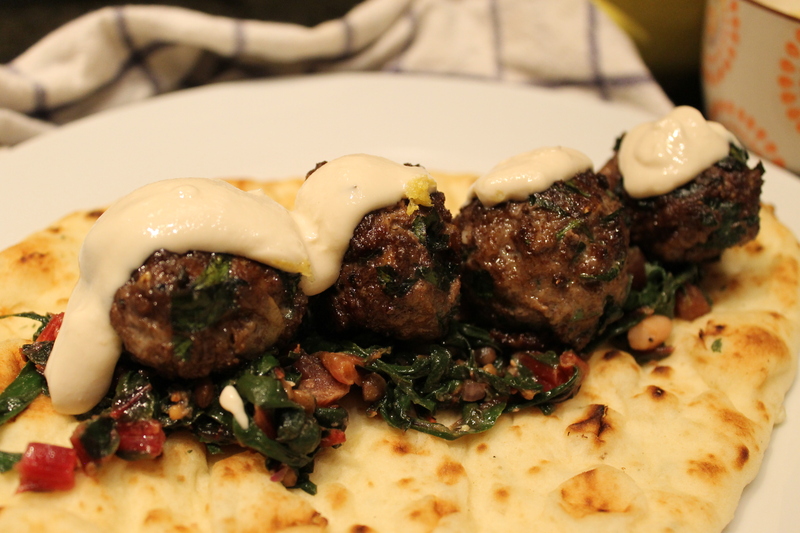 When done, transfer to plates, pour tahini sauce over, and sprinkle with lemon zest. Nom!